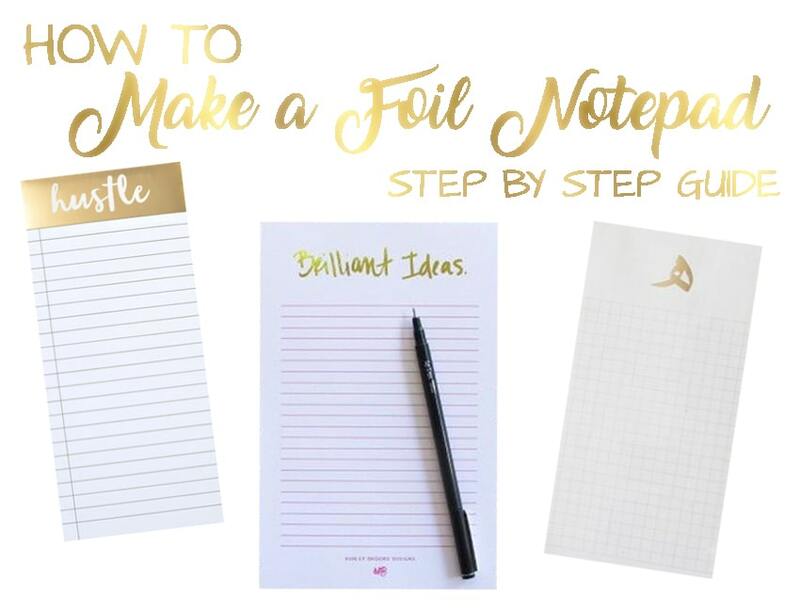 Now that you have everything you need, you can start by foiling your paper. Here are the steps for how to foil your sheets and get them ready for padding. Foiling will work best on smooth paper stock with little or no texture. This does limit your paper choice a bit, however, you can still use a cardstock or thicker paper, as long as it is not textured. Just note that if you are going to use a very thick paper stock, your foiling machine or pouch laminator will require more heat to properly apply the foil. It is important that your design only be printed using a printer or copier that uses dry toner. A wax based ink will not activate the foil, and will not work. To check if your ink is compatible, check your ink cartridge packaging or your printer user manual. Want to test it out? Request a sample piece of foil to test. First, we need to foil your paper. You can do this a few different ways. 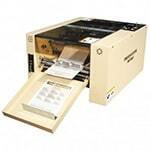 The first way is typically for lower volumes, and is using a heated laminator. 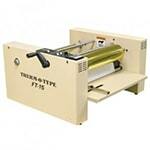 The second way, for higher volumes, is with a foil fuser machine. TIP: You can use lower priced pouch laminators, but they are not guaranteed to work, and you should keep a couple of things in mind: (1) The heat should be adjustable, ideally. This will give you more control over how much heat is applied, so you can really fine tune it to get the best foil. (2) The minimum heat should be 300° F (hotter is better). If your laminator does not reach this temperature, you can try running the page through twice (don't peel off the foil before running it a second time). (3) Adjustable speed is also a bonus to get the best foil, but is not required. A. Warm up your laminator. B. Cut the foil to fit the portion of your design that you want foiled. C. Place the foil with the colored side up over your design. D. Place a piece of scrap paper on top of your foil, taking care to not shift the foil. If your foil overhangs the paper, place an over-sized sheet of scrap paper underneath the paper as well. E. Place your entire setup into a pouch carrier. 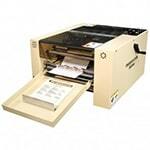 F. Run your pouch carrier through your laminator with the sealed-end first. G. Once ejected, allow a minute or so to cool for the best results. Then open the carrier and peel off the scrap paper. You will experience some static cling. H. Lastly, grab a corner of your foil, and peel it slowly up to reveal your gorgeous foiled design. Having trouble? Visit our how to foil: live more, worry less post for troubleshooting tips and tricks for success. Now all there is left to do is to bind your pages together with a method called "pad binding" or "notepad binding". A. Separate your pages into pads using the optional pad counter, and place a piece of optional chipboard at the bottom of each pad. Layer all of your pages together and jog them into a square stack on your padding press. If not using a padding press, just stack them on a level surface that is short enough to allow for clamping to the table. Hang the edge to be glues over the edge a little bit. B. Clamp your pages tightly together. You can do this with your padding press, table clamps, or even some very heavy books. Make sure the edge to be glues is nice and tight. C. Apply glue to the edge of choice using your padding brush. Allow the glue to dry completely (about 30 minutes, depending on the padding adhesive you are using). Usually one good coat is enough, but sometimes customers prefer to add a second coat after the first dries. D. Now release the clamps and use the padding knife to cut the dried glue below each chipboard sheet, or to whatever thickness you want your pads to be. And that's it! You are left with gorgeous foiled pads of paper that you can sell on Etsy, give away as gifts, or hoard for your own use (so tempting!). 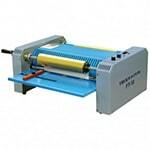 Coupon Details: 5% off Foil Fusing Rolls. Coupon code cannot be combined with other coupons, discounts, or offers. Limited time offer. Subject to change without notice. Code must be used during the ordering process; cannot be applied to any order after it has been placed, shipped, or delivered. Call (866)537-2244 (866)537-2244 with questions.